I was talking with a colleague recently about an upcoming project. In the summary of technologies, he listed 12 factor, microservices, containers, orchestration, CI and nodejs. All familiar to everyone out there, right? 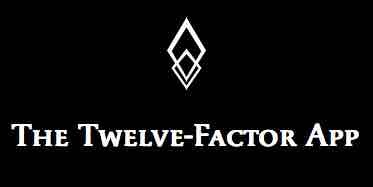 Actually it was the first I had heard of 12 factor, so I did a bit of reading. 12 factor recommends that backing services be treated like attached resources. Databases are loosely coupled to the applications, making it easier to replace a badly behaving database, or connect multiple ones. In 12 Fractured Apps Kelsey Hightower adds that this loose coupling can be taken a step further. Applications shouldn’t even assume the database is available. Why not fall back to some useful state, even when the database isn’t online. Great idea! A read-only or browse-only mode is another example of this. Allow your application to have multiple decoupled database resources, some that are read-only. The application behaves intelligently based on what’s available. I’ve advocated those before in Why Dropbox didn’t have to fail. The twelve-factor app appears to be an excellent guideline on building cleaning applications that are easier to deploy and manage. I’ll be delving into it more in future posts, so check back! Previous PostPrevious Does FedRAMP formalize what good devops already do?